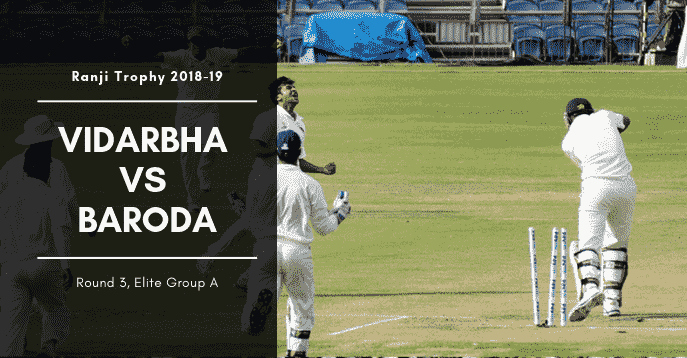 Today Match Prediction of Vidarbha vs Baroda, Round 3, Elite Group A Preview, Playing 11, Injury Updates, News and Dream11 Prediction. VID vs BRD will be looking to register their maiden win. If you are looking for VID vs BRD Dream11 Prediction then you are are the right place. Vidarbha is all set to take on Baroda from Tuesday, November 20, 2018 – Friday, November 23, 2018, at Vidarbha Cricket Association Ground, Nagpur. Do you want to know Who Will Win? Then you are in the right place. In Today’s Dream11 Fantasy Cricket Match of VID vs BRD, we will cover Pitch Report of Vidarbha Cricket Association Ground, Nagpur, Predicted Playing 11, Toss Prediction, and Fantasy Cricket News and Tips. You May Like to Read KAR vs VID Dream11 Prediction. You may Like to Read JOZ vs PR Dream11 Prediction. Who Will Win the Match Between VID vs BRD and Toss Prediction? Where Can You Watch the Live Streaming of VID vs BRD Round 3, Elite Group A or Channels to Watch? Vidarbha the defending champion played two matches but failed to taste the victory yet. Both the matches were drawn and they will look for the maiden win in Ranji Trophy 2018-2019. On the other hand, Baroda has also played two matches and they have lost one and one game was a draw. Vidarbha had managed to save the previous matches after they were asked to follow on. Akshay Wadkar and Faiz Fazal played a crucial knock. Aditya Sarwate contributed with the bat and bowl in the most important match. Baroda lost their last match and will try to recover and bounce back in today’s match. Vishnu Solanki and Yusuf Pathan are the highest run scorer of BRD. Swapnil Singh and Atit Sheth have contributed with the bowl but they couldn’t save the first match. Read the complete lineup, team news and players injury updates below so that you can make a perfect team in Dream11, Myteam11, Halaplay, 11wickets, FanFight or other Fantasy Cricket leagues. Ganesh Satish, Faiz Fazal, Akshay Wadkar, Wasim Jaffer, Aditya Sarwate, Lalit M Yadav, and Akshay Wakhare are the key players of Vidarbha Team. Faiz Fazal will lead the VID Team. Rajneesh Gurbani will not play as he is representing India A.
Akshay Wadkar, Ganesh Satish and Faiz Fazal will lead the batting department. Aditya Sarwate, Lalit M Yadav, and Akshay Wakhare will lead the bowling department. Aditya Sarwate and Faiz Fazal are the most valuable player of Vidarbha. Vidarbha may play with the same playing 11. All-Rounders: Shrikant Wagh, Aditya Sarwate. Bowlers: Akshay Wakhare, Lalit M Yadav, Darshan Nalkande. Akshay Wadkar(w), Faiz Fazal(c), Ganesh Satish, Apoorv Wankhade, Aditya Sarwate, Darshan, Sanjay Ramaswamy, Aditya Thakare, Shrikant Wagh, Siddhesh Wath, Atharwa Taide, Wasim Jaffer, Nalkande, Akshay Wakhare, Rajneesh Gurbani, Lalit M Yadav, Akshay Karnewar. Yusuf Pathan, Vishnu Solanki, Deepak Hooda, Swapnil Singh, Atit Sheth and Bhargav Bhatt are the key players of Baroda Team. Kedar Devdhar will lead BRD Team. Vishnu Solanki, Yusuf Pathan and Deepak Hooda will lead the batting department. Swapnil Singh, Atit Sheth and Bhargav Bhatt will lead the bowling department. Baroda will play with the same playing XI. Batsmen: Kedar Devdhar, Yusuf Pathan, Aditya Waghmode, Vishnu Solanki. Bowlers: Bhargav Bhatt, Atit Sheth, Lukman Meriwala, Babashafi Pathan. Pinal Shah(w), Kedar Devdhar(c), Yusuf Pathan, Atit Sheth, Bhargav Bhatt, Lukman Meriwala, Babashafi Pathan, Pratyush Kumar, Soaeb Tai, Sagar Mangalorkar, Aditya Waghmode, Vishnu Solanki, Swapnil Singh, Deepak Hooda. Fantasy Cricket Tips: Play in small leagues to win every match. Vidarbha and Baroda have played one match against each other and the outcome of that match was a draw. Vidarbha is a defending champion and a strong team to beat. According to crix11 astrology prediction, the outcome of the match will be a draw. VIDAR will win the toss and ask BRODA to bowl first. The match will be played from Tuesday, November 20, 2018 - Friday, November 23, 2018. Match Ranji Trophy 2018-19, Vidarbha vs Baroda, Round 3, Elite Group A.
Venue Nagpur, Vidarbha Cricket Association Ground. Time 04:00 AM GMT, 9:30 AM IST, 09:30 AM LOCAL. The Nagpur pitch is generally slow and favours the bowlers but the today the pitch will be neutral and will assist all three departments. The fast bowlers will get seam and movement in the initial couple of overs. The spinners will also get some help from the wicket. The batsmen will have to show their temperament if they want to score big. Dream11 Fantasy Cricket Tips: Try to take quality batsmen and quality bowlers. Try to take all three all-rounders. It is predicted to be mostly sunny on the first and second day. The third and fourth day will be partly cloudy. There is no sign of rain. The temperature is expected to be 33-Degree Celsius and the humidity to be 36%, which may go up to 49%. Fantasy Cricket Expert Tips of Today Match Prediction: The weather condition will favour the spin bowlers and the batsmen. Star Sports has all the exclusive rights to broadcast Ranji Trophy 2018-2019. Only a couple of matches will be broadcasted live on Starsports. You can also watch the match live on Hotstar Digital Platform (App and Website). You can get the complete ball by ball live commentary of VID vs BRD (Vidarbha vs Baroda), Round 3, Elite Group A – Live Cricket Score, Commentary here. Do you still think that the paid websites will give you any extra information? I know you don’t, at least crix11 users don’t think so as they know that crix11 provides all the information for free. Yes absolutely free. This is it for Today’s VID vs BRD Dream11 Team Prediction of Round 3, Elite Group A. If you want to increase your chance by 100% then read the post carefully as on every section you will find some important information which will help to make a perfect team in dream 11.